Around the mid-August 2009, PokerStars updated their system for earning VPPs mainly at short-handed tables. The change aims to help lower stakes players earn more VPPs by offering fractional VPPs. In this quick guide I will compare the old VPP system to the new VPP system at PokerStars to find out which allows you to earn VPPs more quickly (and get your hands on more cash rewards and stuff). Click here for the quick results. Micro stakes players earn more VPPs. This is for both 6max and FR tables. Small stakes 6max players ($50NL and $100NL) earn less VPPs. Note: Even though I refer to one system as being "old", it is still used at some tables as outlined below. What's the main difference in earning VPPs? VPPs not shared between all players. Each player earns a set amount of VPPs each hand (either 1, 2 or 3). You can only earn 1, 2 or 3 VPPs per hand. VPPs not fractional. This VPP system now only applies to Full Ring NL Hold'em tables at $20NL and higher. Players can now earn fractional VPPs (e.g. 0.67 VPPs instead of just 1, 2 or 3 VPPs). VPPs now shared between all players at the tables. This new VPP system applied to all NL 6max tables and Full Ring NL tables at $10NL and lower. It also applies to all heads-up tables. As I hope you can see, the systems for calculating how many VPPs you earn per hand are quite different. I just outlined the key differences here, but if you want further details you can check out the earning VPPs page at PokerStars. Now let's see how both of these systems compare when it comes to collecting VPPs during play. How do the old and new VPP systems compare? With the old system you earn VPPs more discretely. With the new system VPPs are earned more continuously. The diagram below highlights how many VPPs you earn per $ raked for both the new and older VIP program systems at PokerStars at 6max tables with 6 players sitting at the table. Earning VPPs at 6max tables diagram. As you can see from this diagram, the amount of VPPs that you can earn with the new system is far more varied. Conversely, with the old VPP system you have to hit certain total pot rake thresholds before earning more VPPs in each hand. Benefits of the new system. Micro stakes players who infrequently raked 40c+ pots can now earn far more VPPs. Players who frequently raked between $2.4 and $5 pots can now also earn more VPPs for their efforts. Downsides to the new VPP system. Players who frequently rake between 40c and $1.2 pots will be earning less VPPs for their efforts. The players that frequently rake between 40c and $1.2 a pot will be the ones playing at $50NL and $100NL. So if you're a 6max player that plays at either $50NL or $100NL, you can expect to generally earn less VPPs and thus less FPPs than you used to with the old VIP earnings system. 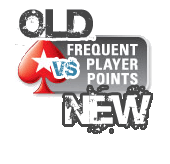 New PokerStars VPP loyalty system evaluation. So I guess the new system is either a good thing or a bad thing depending on where you play. The micro stakes and mid to high stakes players will really benefit from this system, but I feel for the small stakes grinders that are going to have a slightly reduced rate of earning those VPPs and FPPs. However, I don't believe that the reduced rate of VPPs for these stakes is going to be vastly lower - just a little less than before. So in conclusion, when you weigh up all the pros and cons, the new way of earning VPPs at PokerStars is better than the old one (for the majority of players). But I guess that's only take the stance of a player looking at the new system as a whole.